When comedy heroes die, the world becomes a sadder place. Today James Avery – ‘Uncle Phil’ from the Fresh Prince of Bel Air passed away. A day before John Fortune of Channel 4’s Bremner, Bird and Fortune departed this world. The former was part of the glue of a series that for my generation and even that of my parents, was truly a breath of Fresh air. Despite its many problems, not least a rampant sexism, here was a programme that didn’t shy away from calling white authorities racist, police officers racists and assimilated minorities sell-outs. And unlike Dr Huxtable of the Cosby show, Uncle Phil – the uber-successful lawyer had a back story where he fought them all. John Fortune, one half of the Two Johns brought a biting satire to current affairs in the 1990s and 2000s. Part of a duo ahead of their time, both comedic and political, in unpacking hypocrisy and corruption from the lead up to the Iraq war to the looming banking crisis, Fortune didn’t just make is laugh, he taught. Today also saw the release of Lynne Stewart from a US prison. Described as a radical lawyer, she is quite simply an inspiration. Persecuted for her advocacy for the imprisoned Sheikh Omar AbdulRahman, she found herself also in gaol on accusations of aiding terrorism in the performance of her duties as attorney. Originally meant to serve time until 2018, she was released after the Prisons Bureau requested she be granted compassionate leave – Stewart is dying of cancer. Her own application and much campaigning on her behalf had previously been denied. IHRC were just one of the many who campaigned for her. We recently submitted her case in a report to the ICCPR at the United Nations. In our report of concerns on political and civil rights in the US. The other prisoners whose cases we highlighted as part of the problem of political prisoners in the US were Sheikh Omar Abdul Rahman, Mumia Abu Jamal, Imam Jamil al-Amin, the Holy Land 5 and Aafia Siddiqui. Let us hope and pray for more happy outcomes. Two anniversaries of note fell today. 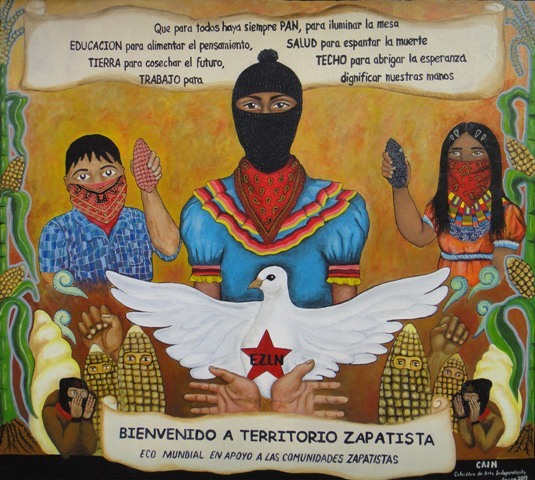 The revolution in Cuba in 1968 and the uprising of the Zapatistas in Mexico in 1994. Of the former I have some knowledge, of the latter I need to learn much more. So I sign off in order to return to the three part essay I was reading to get a better understanding of what is a movement of profound epistemological significance. One that seeks pluriversality in its attempts to transform a hegemonic deeply unjust world. On a day when even the sadness contains some memory of hope, Hasta la Victoria Siempre!